If you want to see our products during the operation, you can do this on our YueTube channel. You can survey some motor-driven units from our product range on this channel. Of course, we can advise you professionally at our business premises, where you can take our products to the hand and try it out locally. It is possible, that the distance is too far for you or you firstly want to inform yourself without ruffle or excitement at home. For these customers we have made product videos. In almost all video clips, the products and their functions and application possibilities are explained. You can also, of course, make use of a personal consultation by phone or you can send your questions online, so that we can contact you. 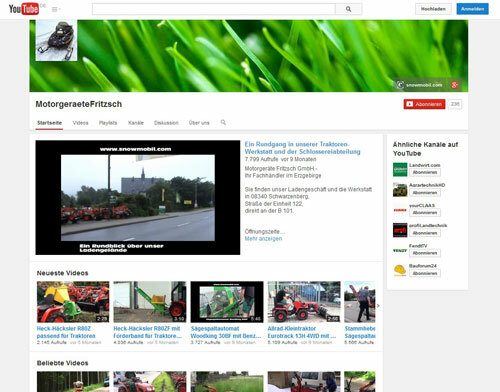 Visit the channel of Motorgeraete Fritzsch with more than 120 informative videos about our motor-driven equipment.